It takes special people to settle the Judean Desert. And there is little in Chaya and Shimon Ben-Dor’s cosmopolitan upbringing that would foretell the ability to successfully adapt to the desert’s pace and rugged landscape. 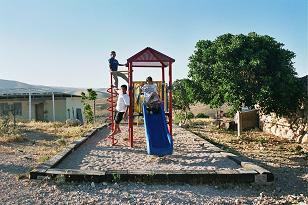 Yet despite many hardships and obstacles, the Ben-Dors established Mitzpeh Chagit in 1999 – braving the elements, the Bedouins, the isolation and the political difficulties – to build a unique community that is at one with the natural rhythm and life of the desert. Soon after they were married in 1987, Chaya and Shimon helped found Alon, a small community located east of Jerusalem on the edge of the Judean Desert. The Ben-Dors lived comfortably in Alon, busy working and raising their family. But when their dear friend Chagit Zabitizky and another young woman were murdered by Bedouin terrorists in the area, they felt a burning passion to contribute even more to the ongoing struggle to settle the barren desert and halt the PA-supported terror of the local Bedouins. Their new home in Mitzpeh Chagit, named in memory of their friend, completed a ring of Jewish settlements around the holy city of Jerusalem. They lived all alone on the isolated hilltop from February 1999 to November 1999, with no running water, electricity or basic services. Political controversy resulted in their evacuation to neighboring Kfar Adumim until August 2000, when they returned with their three young children and newborn baby. Soon after, the war of terror launched by the Palestinians and their Bedouin coconspirators had them under siege, so they did everything possible to stake a permanent claim to the land. They built a wall of stone adjacent to their home, planted produce and herded sheep. Since then, five other families have joined them, and together they are strengthening the desert outpost using the “security” methods used by centuries of desert dwellers – growing their own vegetables and fruit, tending their olive grove and raising sheep.